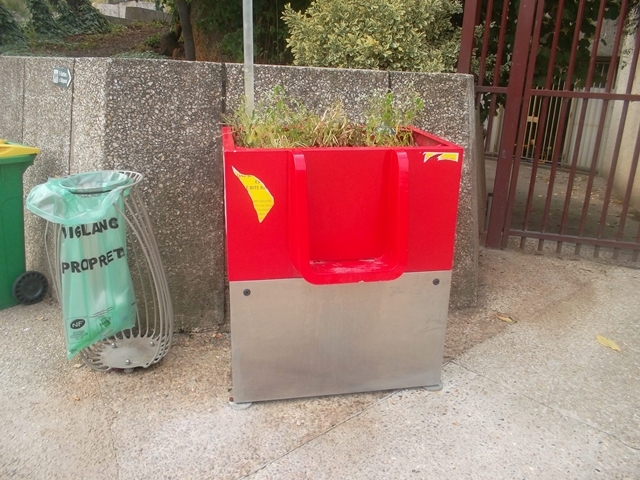 It is Paris’s newest public urinal for men. 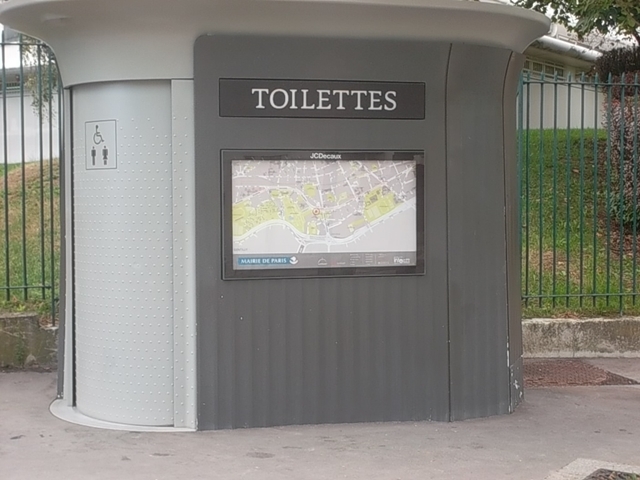 Known in French as an uritrottoirs – uri for urine and trottoirs for pavement (sidewalk) – four of them were placed in tourist spots in the French capital this month of August 2018. I had to go and see one and take a photo, so walking up to one I was asking the Good Lord please not to have it in use when I approach with my camera. Fortunately, it was not. 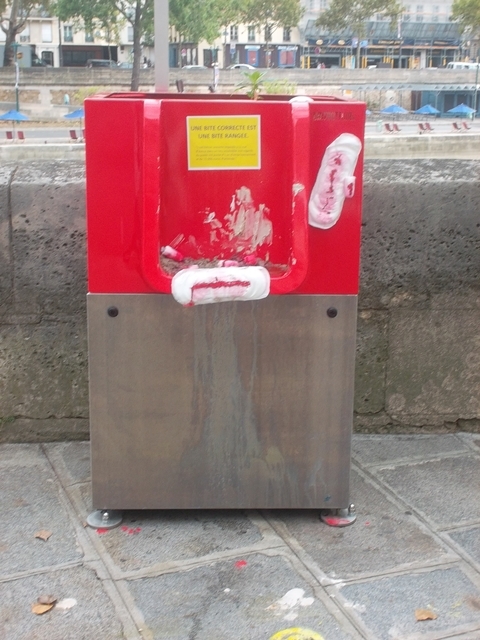 I think this is a disgusting thing, and so do most Parisians, and certainly tourists. The uritrottoirs is the brainchild of the industrial design company Faltazi based in the city of Nantes. Faltazi’s CEO Laurent Lebot thinks the thing is wonderful. It will, he says, make Paris’s pavements cleaner and certainly less smelly. Yes, early on a Sunday morning, walking in the vicinity of a night club or bar, it can be rather smelly. This is despite that as every male Parisian knows it is a punishable offence to urinate or defecate in a public place, say a street or a park. The fine for being caught doing so is € 68 – £61 / $79. Of course the culprit must be caught ‘in the act’. Surely any policeman seeing a man urinating openly would rather turn away than approach to tell him to button up and instead take out his wallet, yet in 2017, 5381 men have been so caught and fined. 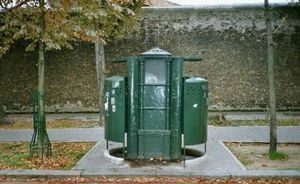 I wrote about the problem of finding a public toilet in Paris and you can read it here – https://www.marilynztomlins.com/articles/paris-public-toilets-few-and-far-between/ – so do please do so as the history of France and bodily functions is interesting. I will however say that in 1830 a cylindrical metal structure had been erected all over Paris for men to step into and urinate. These were called a vespasienne after the Roman emperor Titus Flavius Vespasianus (AD 9/79) and Emperor from AD 69/79 who had introduced a tax on urine as his Roman subjects had begun to run a racket selling urine to tanners. These vespasiennes were terribly smelly: one could see the user’s head and his ankles and feet and of course the yellow rivulet at his feet. One still exists, and is still operational. 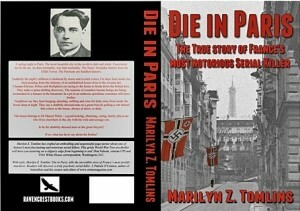 It is on Boulevard Arago close to La Sante Prison in Paris’s 13th arrondissement (district). Such a vespasiennes was familiarly called a pissoire. Today, Paris has sanisettes of which there are 400, though not enough for a city in which millions of people circulate daily. They are free and self-cleaning after each use. They can also be somewhat smelly which is because some days usage is hectic and not all respect the floor. Unlike the vespasienne and the uritrottoires they are for both men and women. Monsieur Lebot is though now thinking of designing a female version of the uritrottoirs. My mind boggles as to what he will come up with. What to do if one needs a toilet urgently has always been a problem in Paris. 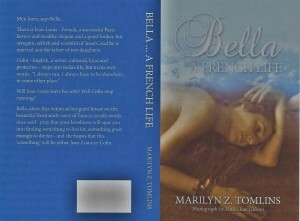 Not only for Parisians but also, and especially, for tourists. Parisians pop into a bistrot (bar), stand at the counter and order a small black coffee, drink it up quickly and rush to the toilet. Such a small black coffee will cost around two euros. There are some who think that this is an expensive way of spending a penny. The good news about the uritrottoirs is that the urine falls on to straw and the straw, which according to Monsieur Lebot will be an excelent fertiliser, will be collected and taken to public gardens and the parks of chateaux (castles) and will also be given free of charge to any farmer who wishes to have some. 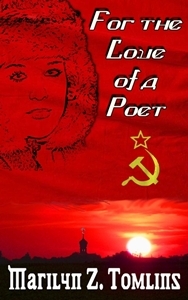 It will make the flowers and the fruit and vegetables grow beautifully. 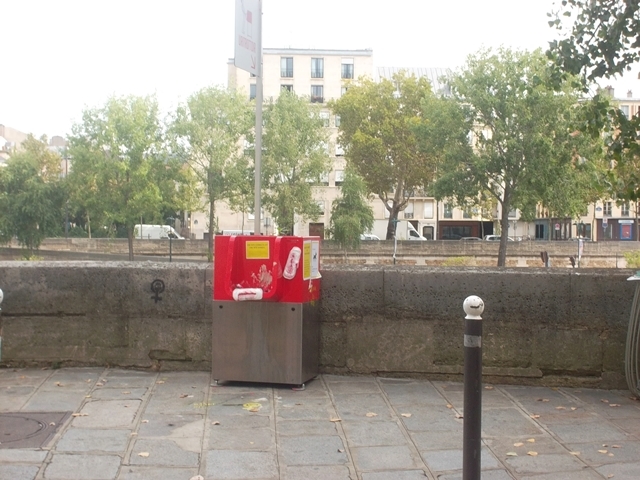 I wonder if Monsieur Lebot and the Paris authorities who have welcomed the uritrottoirs have given a thought to how the things could be dirtied? Here below is a close-up of the one I went to photograph. Your guess is as good as mine as to what it is which has been put on it. 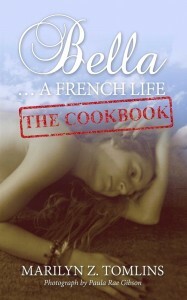 It is on Paris’s Ile Saint Louis, on Quay d’Anjou. I must say that to buy or rent property on the Ile Saint Louis, one of the two islands on the Seine in central Paris, will rob you of an arm and a leg. Those who therefore live facing this uritrottoir are very displeased.